Sun City Grand Rosewood, a one-of-the-kind estate model home! 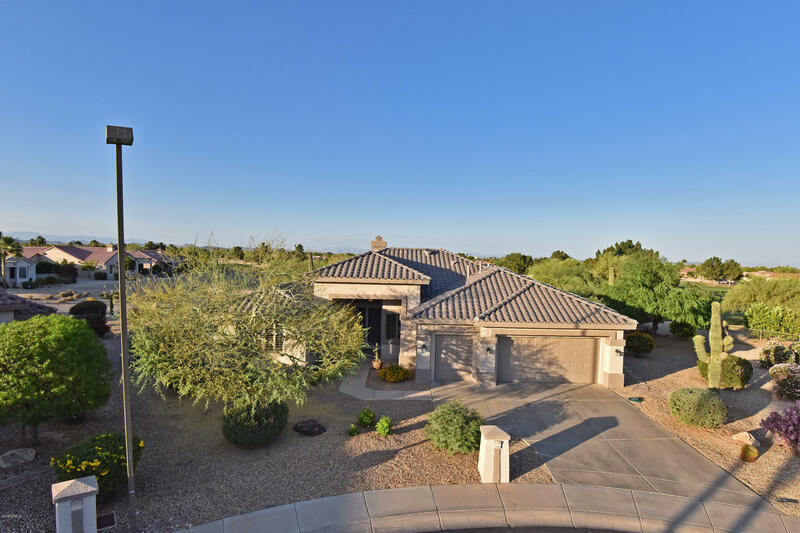 Located on the 3rd hole of Granite Falls North Golf Course, home has a 180-degree view - if not the best in Grand! The 15,200 sf raised lot overlooks the lake, green, and tee box. Home features Vestibule Foyer, Stainless appliances, Corian counters, pull-out shelves, snail shower in master, guest bedroom with en-suite bath, powder room, Built-in office in den, Plantation Shutters, Wine Refrigerator at wet bar, California style closet organizers, fireplace and extended covered patio. Storm shutters are grandfathered. The OWNED solar panels provide TREMENDOUS utility savings!